Michael Franti founded Spearhead after working with Disposable Heroes of Hiphoprisy and the Beatnigs, bringing elements of funk, soul and reggae to bear on a hip-hop base. Atop this hybrid of styles, Franti, in a gorgeous high baritone, made like a wannabe Bob Marley, positing a “one world, one love” vibe atop sunny melodies and deep grooves. The result was the creation and maintenance of a sizable worldwide “cult-sized” audience. Fans who have been with Franti &amp; Spearhead from the beginning might find “All People” a tough meal to digest. It’s all but devoid of the rhythm section grooves that have always rooted Spearhead’s sound. Bassist Carl Young and drummer Manas Itene are on the album, but they don’t contribute much when they aren’t buried beneath the thick wash of electro-pop flourishes that connect “All People” to contemporary electronic dance music much more than to anything resembling world beat. That’s a bummer. That said, if we simply accept “All People” as nothing more than a contemporary pop album, devoid of expectations that previous familiarity with Franti might engender, it’s difficult to dislike the thing. This is sun-soaked pop music with feel-good, bumper sticker-style wisdom presented as insightful commentary. Franti’s past music is heavy on the social criticism, but this time he seems happy to simply proclaim “I’m alive, I’m alive, I’m alive,” as he does during the Train-like raver “I’m Alive (Life Sounds Like).” It ain’t deep, but he sounds like he’s having a good time singing it. 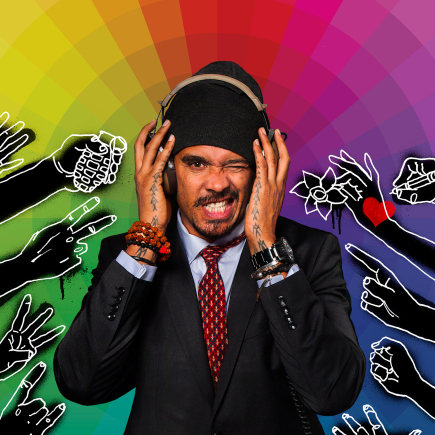 The title song marries cut-and-paste acoustic guitars to electronic bleeps and computer percussion, as Franti duets with singer Gina Rene on a sunny melodic line above a straight EDM arrangement. It’s giddy stuff, but one would be hard-pressed to uncover the contributions of a living, breathing group of musicians here. The ballad “11:59” is a high point, and not just because of the string arrangement written by Buffalo’s Richie English, but because it boasts the album’s strongest vocal melody. “Earth From Outer Space” has a Dub underpinning, and again, Franti’s unflagging optimism is contagious. Most of “All People” sounds as if it will be presented in a much more organic, muscular and therefore flattering light in the concert setting. The production is contemporary and polished, but somehow, some of Franti’s fire is smothered by the slickness. “All People” might cost Franti some old fans, but it is highly likely to earn him new (and younger) ones, too.